awarded to Rutland County Council and its successor administration, in 1950. William the Conqueror awarded land in the county to Henry de Ferrers, whose surname indicates a connection with iron-working or the farrier occupation. 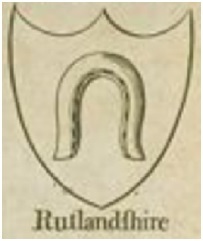 Perhaps in recognition of this association, he claimed the “forfeit” of a horseshoe from anyone of rank visiting his lordship in Oakham; royalty, peers of the realm and noblemen would present a horseshoe to the Castle Hall in Oakham, which now houses a large and unique collection! 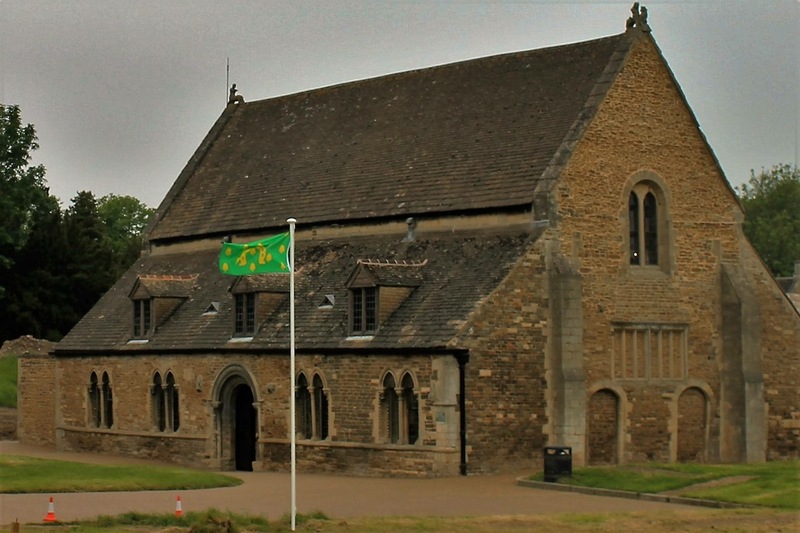 Oakham castle was constructed by Walchelin de Ferriers, great grandson of Henry, who not surprisingly bore arms bearing the horseshoes with which the family had become strongly associated in a quasi canting application. and was subsequently informally adopted by Rutland County Council, formed in 1889.
in apparent recognition of the device’s representation of the county, continuing the practice first evident in the Conder map. 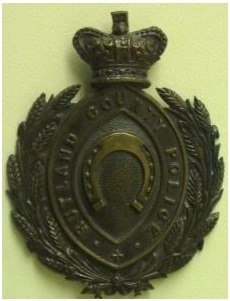 By 1908 cap badges bearing a horseshoe were being worn by Rutland Police. 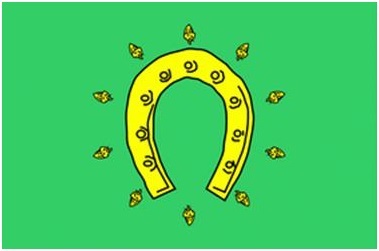 by the College of Arms, with the gold horseshoe against the green field, that had become the accepted local depiction. 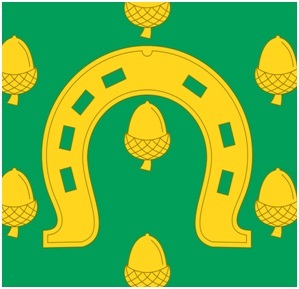 The official blazon states that the green field represents the county’s agriculture. 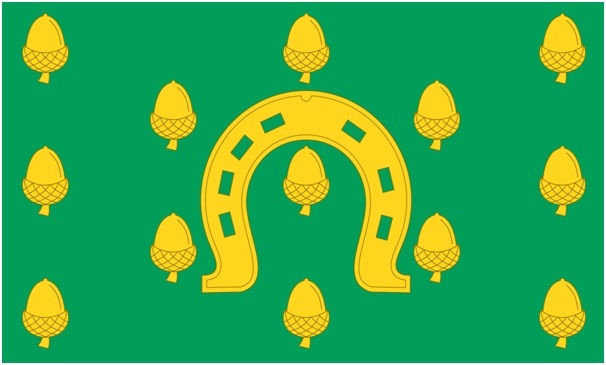 Strewn across the shield are golden acorns which symbolise the extensive forest that once covered much of the county, reflected in the name of the county town, Oakham. The acorns are also deemed to represent “smallness”, an allusion to Rutland’s position as England’s smallest county. 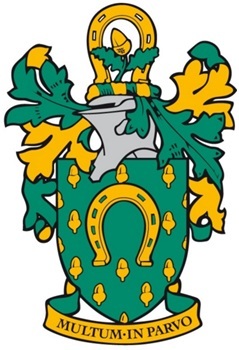 Since then many county organisations, clubs and businesses, have made use of the traditional Gold Horseshoe on Green, to represent the county of Rutland on their insignia and labeling. Rutland Sailing Club; Rutland Water Fly Fishers; Oakham Bowling Club; The Society of Leicestershire and Rutland Golf Captains; Oakham Rugby Football Club. County organisations and charities including Leicestershire and Rutland Women’s Institute; Leicestershire And Rutland Family History Association; Leicestershire And Rutland Freemasons. 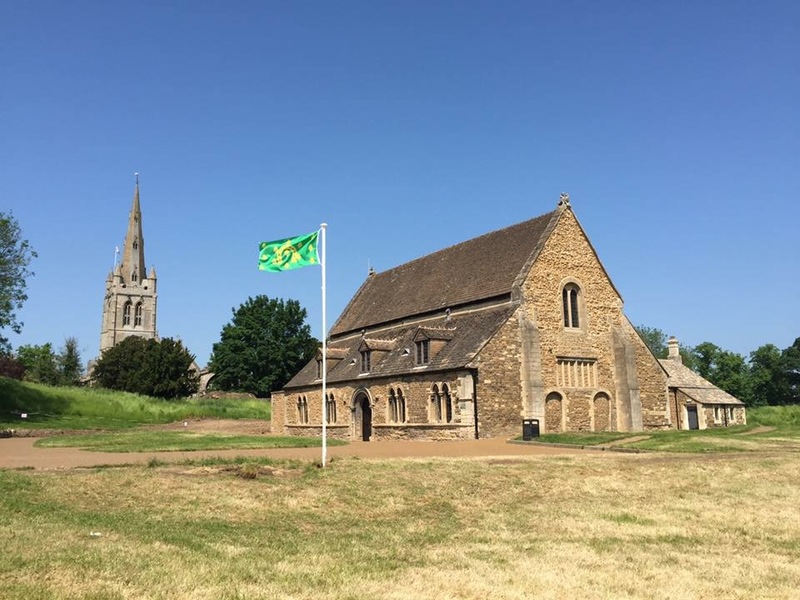 The High Sheriff duly consulted the local council, who, realising that Rutland was not included on the Flag Institute registry, concluded that it would release its banner of arms, its coat of arms in flag form, for general use to represent the county. 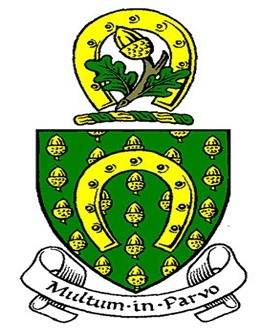 The council’s armorial banner had been pointedly used in 1997 to mark the restitution of Rutland County Council following another round of local government reform. Its appearance on this occasion served to proclaim the county to the world. 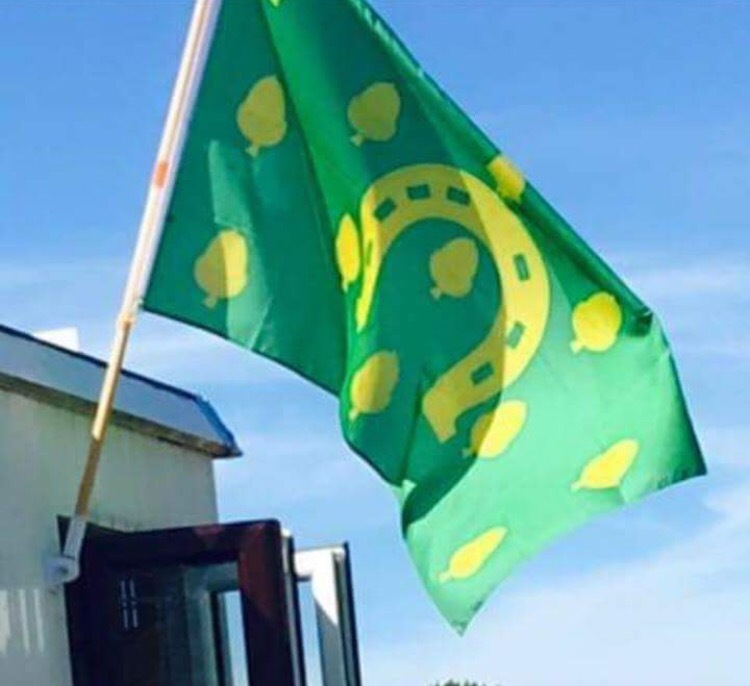 for example, used by Oakham protesters opposed to the council’s introduction of a one way system through the town, such usage of the acorn strewn version solidified its linkage with the county, making it a very apparent county symbol in this small territory, familiar to residents; its deployment as a true county flag was a natural development, maintaining the association of the county with the golden horseshoe. 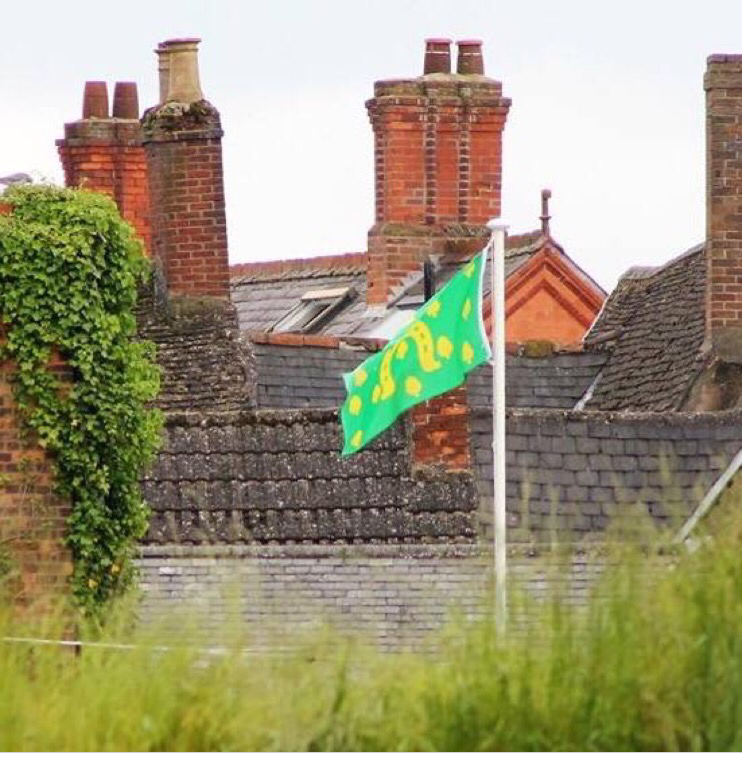 The Rutland county flag is seen below flying outside the council offices in Oakham. 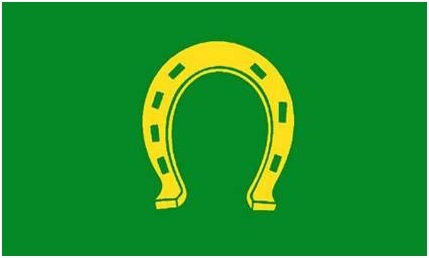 A notable feature of the flag is that the horseshoe is depicted with three nails on one side of the shoe and four on the other, a traditional heraldic depiction that reflects the standard UK practice of affixing horseshoes with seven nails. It’s also worth noting that the horseshoe is displayed tips down. This reflects the local tradition of how horseshoes were hung in Oakham Castle hall, “so the devil cannot make a nest at the bottom” ! was commercially available; a very poor realisation of the horseshoe and acorns. With thanks to Brady Ells for his extensive research on this topic.